Jonathan Goldstein is an associate in the firm’s Finance & Acquisitions Department, where his practice focuses on real estate transactions. As a member of the firm’s Real Estate Group, he represents clients in acquisitions, development, financing, leasing, and disposition of real property interests nationwide. He also advises private companies more generally in complex commercial transactions, including mergers and acquisitions, joint ventures, debt and equity financings, and commercial contracts. Before joining DGS, Mr. Goldstein served as law clerk to the Honorable Daniel M. Taubman on the Colorado Court of Appeals and was a U.S. Peace Corps Volunteer in Peru. He is a member of the William E. Doyle Inn of Court and the American, Colorado, and Denver Bar Associations. 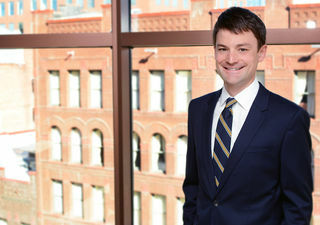 He serves on the Colorado Lawyers Committee’s Voter ID Subcommittee of the Election Task Force and is a participant in Downtown Denver Partnership’s 2018 Leadership Program.